More shopping malls are popping up! "Green Malls" seems to be in the in-thing too! This was the previous Jurong Entertainment Centre. 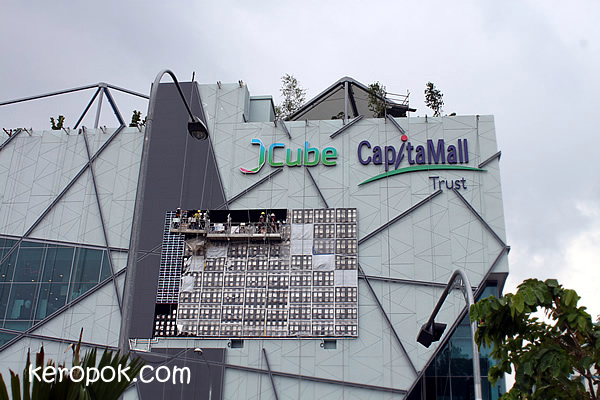 It's now called JCube, because it's design to look like an ice cube! 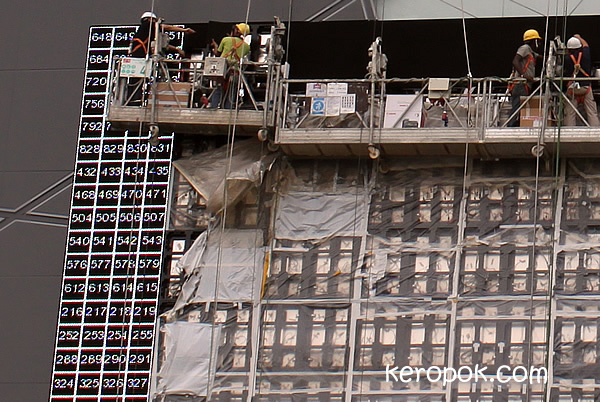 I think it's gonna be very different from the previous mall. I used to only walk through it because it was a shortcut to get the Jurong Regional Library. Remember the skating ring on the top level? Now, it has Singapore's first Olympic sized Ice Rink. What caught my eye was the people fixing up the panels. These should be LED panels. Read that LED lights are used inside and they have solar panels to supplement energy from the Grid. I was like looking at the numbers of squares and the numbers there! The numbers seems to be sequential if you look at it horizontally. But each line has different starting number.